Cameron Champ hits his drive on the seventh hole during the first round of the WinCo Foods Portland Open. Cameron Champ. If you haven't heard the name yet, get used to it. The PGA Tour's newest rookie has only played one event so far this season, but his Trackman and driver stats are already amazingly powerful. The 23-year-old first made his introduction to the golf world at the 2017 U.S. Open, when he was inside the top 10 after two rounds. The former Texas A&M product turned professional later that year and completed a season on the Web.com Tour that included a victory at the Utah Championship. GOLF Top 100 Teacher Sean Foley, who works with the likes of Justin Rose and was the former swing coach to Tiger Woods, has been working with Champ since he was 15. Last year, he told Golfweek that he was amazed by Champ's power from the second he watched him swing a club. “I’d never seen speed like this,” Foley said. "We’re basically looking at Usain Bolt." And during his T-25 performance Safeway Open last week, Champ began demonstrating his power. Here's a quick rundown of his key driving and Trackman numbers from last week. The ball speed is particular impressive. To help put that number into context: Trey Mullinax clocked a 182 mph average ball speed to lead the PGA Tour last season. Brandon Hagy had the second-highest average ball speed in the field with 186 mph. Champ's was over 192 mph. 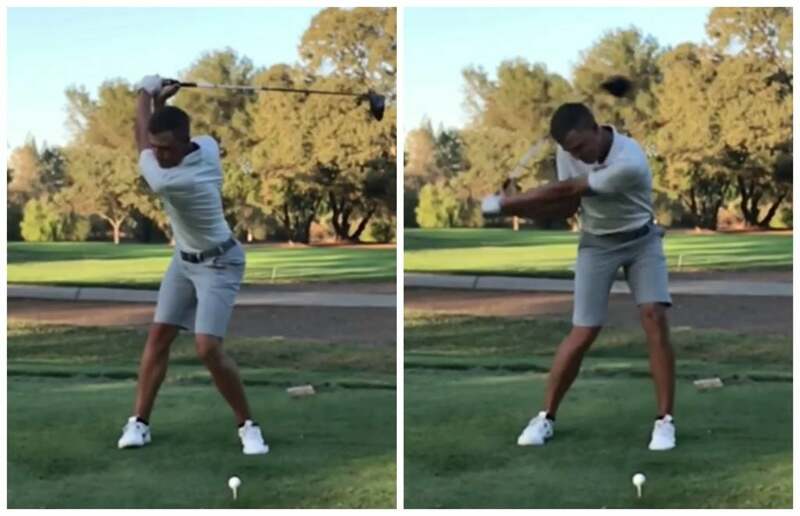 In short, the ball is coming off his club face really, really fast. But yes, I know what you're going to say. It's a small sample size, and you'd be right. 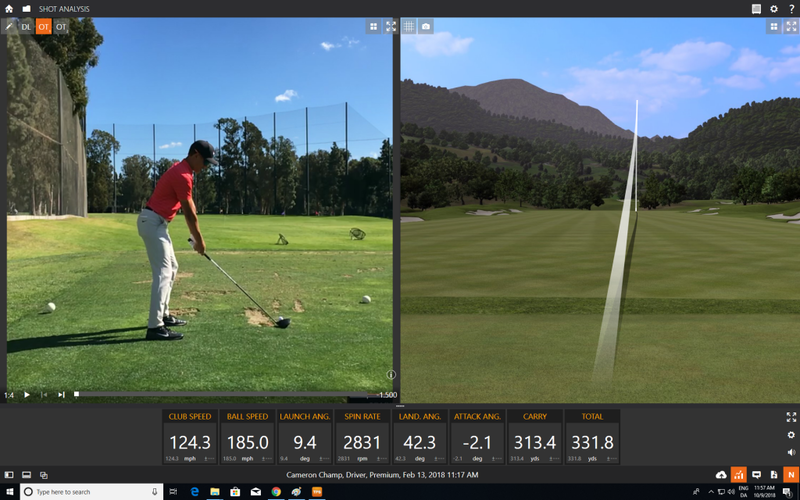 So, we reached out to the brilliant minds over at Trackman, who provided us with some exclusive looks at Champ's Trackman numbers. Here's a snapshot of a shot of Champ's from an average range session earlier this year. His on-course ball speed typically ranges in the low ~190 mph range. He's not going at the ball as hard on the range at a regular basis, but his ball speed is still a monstrous 185 on this occasion. But, again, that's on easy swings. 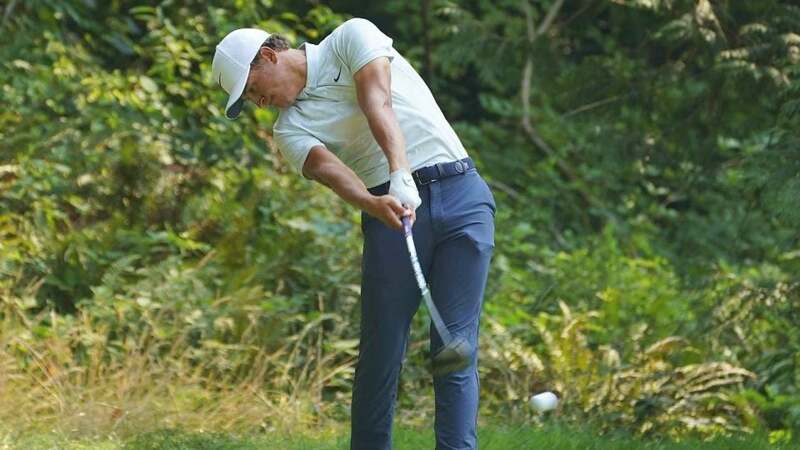 He can crank it up basically on command, as he showed during a recent fitting session with Ping where his ball-speed jumped to 194 mph. And the most amazing thing? His swing doesn't even look violently powerful, in the way of Bubba Watson or John Daly. See for yourself: Here's him hitting a driving iron a few months ago. It looks fast and powerful, of course, but also smooth and rhythmic. How? In short, it's his first move from the top of the backswing. As you can see in the left frame, he's stacked his weight and created a big, wide arc on his backswing. On the right frame, you can see his wrists re-hinge in a kind of Hogan-esque move; his arms are acting as a whip as his lower body drives and unleashes through the ball. The result is a smooth, aesthetic, and supremely powerful golf swing.